Don't give up the luxury of a small compact receiver with instantaneous positioning in order to increase your accuracy and functionality in the field. 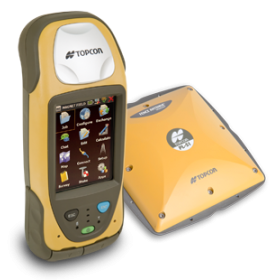 With an integrated cellular modem and Wireless LAN, Gps Geodetik Topcon GRS-1 is the perfect solution for GIS users with high accuracy requirements who need real-time detail in the field but not a lot of headaches. Gps Geodetik Topcon GRS-1 integrates an internal 2 megapixel autofocus digital camera to snap descriptive digital photographs. These photographs are automatically linked to GIS features so that no photo file manipulation is needed after the field work is complete. With 256MB of SDRAM and an 806MHz processor, the GRS-1 provides the fastest handheld performance on the market. It is loaded with memory (1GB Flash), but if needed, users can easily increase the memory for photo storage, maps or field data files by sliding an SD Memory card into the slot on the bottom of the GRS-1. With the GRS-1 the amount of detailed, accurate information that can be collected and stored is incredible. When combined with the lightweight small size of the system, the result is unprecedented.